In its 47 years, the UK’s Wolfson History Prize has awarded more than £1.1 million (US$1.4 million) in prize money to more than 100 authors of historical writing. Previous winners include Mary Beard, Simon Schama, Eric J. Hobsbawm, Amanda Vickery, Antony Beevor, Christopher Bayly, and Antonia Fraser. The purse this year is £40,000 (US$52,400) for the program’s winner and £4,000 (US$5,240) for each of the shortlisted writers being announced today (April 15). As Publishing Perspectives readers may recall, the University of Warwick’s Peter Marshall was the 2018 winner for his Heretics and Believers: A History of the English Reformation (Yale University Press). Major university presses are the publishers of the bulk of this content. Yale University Press makes two appearances on the six-book shortlist, as does Oxford University Press. Princeton University Press is the publisher of a fifth entry, and the Head of Zeus Apollo imprint produces the sixth, a standout, as it happens, simply for not being the product of a big campus press. 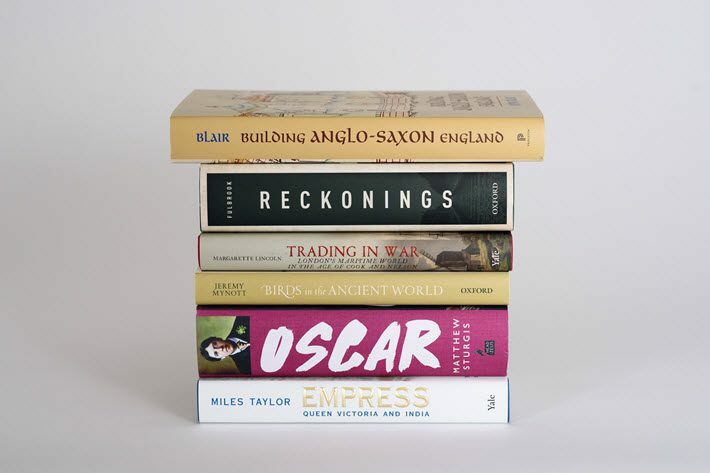 The winner of the Wolfson History Prize 2019 from the Wolfson Foundation is to be named at Claridge’s in London on June 11. In a prepared statement, Cannadine, chair of the jury, is quoted, saying, “The great strength and depth of history writing in the UK is demonstrated by this year’s shortlist. “It brings together a range of authors, writing very different types of history across many periods and from divergent perspectives. The unifying element is a commitment to share their meticulous research and passion for their subject with as wide an audience as possible. And from Paul Ramsbottom, who leads the Wolfson Foundation, comes the statement, “The Wolfson Foundation awards the Wolfson History Prize to make a public statement about the importance of history writing to society. As the organizers are pointing out, this year’s shortlist includes two prominent personal histories, one of Queen Victoria and one of Oscar Wilde. The organizers assert that Matthew Sturgis’ book on Wilde is the first such biography in 30 years. And the Wilde book is also of interest because–as is easily discerned by a look at the list’s publishers–it is the only work of a non-academic historian. Considering the preponderance of the Yale-Princeton-Oxford axis on the list, it’s a commendation to Sturgis and Head of Zeus to have made the shortlist. Also of special interest, illustrations play a role in the Jeremy Mynott book on birds, in a plate, for example, showing a kingfisher in a mosaic in the House of Blandus at Pompeii, and a plate picturing an Attic urn from 515 to 505 BC depicting two men and a boy greeting the first swallow of spring. More can be learned on May 7, when the shortlisted authors can be head in a recorded conversation about their work with Rana Mitter on BBC Radio 3’s Free Thinking program. More from Publishing Perspectives on publishing and book awards is here.